As a storyteller, singer and musician I work (at various times) on stage in theatre or music, in schools, writing books and scripts for radio and TV documentaries, broadcasting, production of audio tours and CDs, and other bits and pieces to keep the mind occupied and the wolf from the door. I’ve survived in my version of ‘show business’ for forty years now, and it’s too late to give up. Philosophically, spiritually and culturally, my patch is Australia. Yes, a big patch, but what I mean is that I stick to Australian material: folk songs, my own songs, and stories I’ve written or stumbled across and researched. 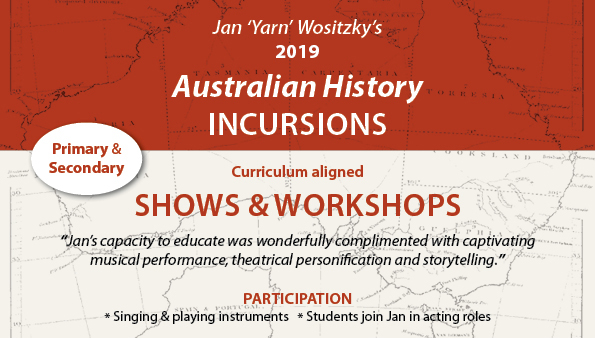 Why Australian…with a name like Wositzky? (they always ask). Well, if your name was Namatjira then McDonough would be just as foreign as Wositzky. And I don’t see any sense in being an Australian that sings in American. But if I look in the rear vision mirror… I came here in 1956, a boy with my Czech father and Scots mother. Both had a great love of the literature, music and history of their homelands. So to make this place home I had to find that same love of the song and story of Australia. And I have. My self-appointed job is to pass it on. The other possible explanation is that in 1971, with no musical ability whatsoever except that I could keep a beat, I fell into The Bushwackers Band, and have ever since done everything in my power to avoid having a real job. It’s probably both. 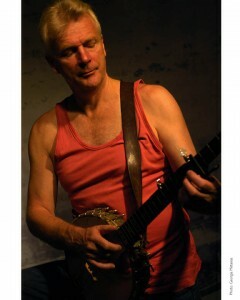 My career began in 1971 as a founder of the renowned Bushwackers Band, playing the humble tea-chest bass. It was my decade-long apprenticeship, touring Australia and Europe, recording six albums, and beginning a publishing career with the best-selling Bushwackers Song Book and Bushwackers Dance Book. Then in the early ‘80’s I went ‘up north’ to learn about Australia, and life, from Aboriginal people, and subsequently co-created the acclaimed Fruitcake of Australian Stories – possibly the first production where black and white Australians shared a stage telling their stories. 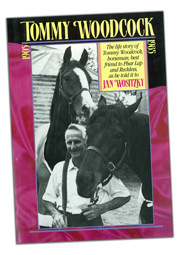 In 1986 I was lucky to meet Phar Lap’s strapper, Tommy Woodcock, a great yarn-spinner, and our book of his life, Tommy Woodcock, jumped to the top of the best-seller lists. Back north in 1988, I scripted my first television documentary, Buwarrala Akarriya – Journey East (ABC). Made with Yanyuwa, Garrwa and Mara people at Borroloola, NT. The program won two Australian Teachers of Media Awards – for Best Documentary and Best Australian Production. This was followed by Aeroplane Dance (SBS) which bagged several Australian and international awards. (To view Aeroplane Dance clip, click here … Warning: this footage contains images of people who have died). 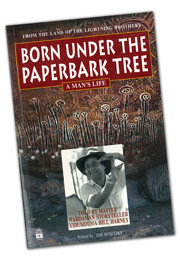 Also in the NT I had the honour of becoming a friend with one of our genuine living treasures, Wardaman elder, Yidumduma Bill Harney, and our book, Born Under The Paperbark Tree, is available from JB Books. Weaving in and out of these projects have been my own solo and ensemble shows, at schools, festivals and theatres, with very complimentary reviews for Whitefella Learns to Dance (1990) and Buckley:The Go-between (2007). Another passion has been radio, and over the years I’ve hosted live-to-air programs on ABC Melbourne’s 774, and produced a dozen features for Radio National programs such as Hindsight, The Law Report and Books and Writing. 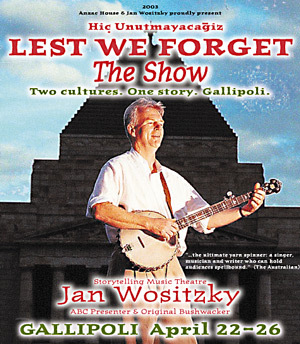 Naturally over forty years in this business there’s been lots of highlights and my share of rough patches, but one big stand out gig was performing a solo version of Lest We Forget: Hic Unutmaya Cacgiz before the 2003 Dawn Service at Gallipoli. 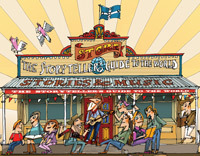 This production, a combination of Australian and Turkish music and stories, is an example of my take on Australian multiculturalism: where I work off a base of knowing my own culture, then combine with people from other cultures and communities – Indigenous, Turkish, Chinese, Greek, Italian – to create a larger Australian story where everyone can stand proud. How does a nation decide which stories are ‘true’ and which stories are worth remembering?